If you’re not already using video as part of your digital content strategy, you’re missing out on one of the most effective tools available to modern marketers. Just a few minutes on YouTube will help you understand the incredible range of possibilities for this powerful medium, from interviews shot with a smartphone, to simple animations, to full-on Hollywood-style productions. The good news is video doesn’t have to be complex to have a dramatic impact on your website, at trade shows and in social media. Here are five good reasons why video should be an integral part of your content marketing strategy. Did you know that using video on social media generates 1,200 percent more shares than text and images combined and that video drives a 157 percent increase in organic search traffic? It’s no surprise that more than half of marketing professionals consider video to have the best ROI of any content marketing tool. If marketing is about telling your company’s story, video is engaging and interactive in ways that are just not possible with text. Let’s say your CEO is explaining what sets your company apart from competitors and you present two options on your website: a video and a 600-word summary. Which do you think visitors will choose? Which would you choose? Videos are easy, accessible ways to gain information and are a reliable favorite. Video also provides an opportunity to bring an emotional element to your brand identity. Even in technical fields like life sciences and drug development, the goal of building a brand is to connect with clients and prospects on a personal level because emotion aids memorability and drives purchase behavior. Video can be cost-effectively integrated across your entire digital marketing program. Properly planned, a longer or more complex video for a product or service launch can be judiciously repurposed for BD or investor presentations, incorporated as part of your trade show exhibit, featured on your website or in social media, or even used in your internal training. When you develop a video library over time, you’ll be surprised at the number of ways you can put good video to good use. Buyer behaviors have changed in the digital age. Buyers of technical products like electron microscopes or mass spectrometers have always put factfinding at the forefront of their buying process, but today instead of tedious requests for literature, almost all product or service purchases begin with a Google search. What this tells us is that it’s important that your sales support literature look good, but your website had better be spot-on — and one of its key features should be video. More than half of marketing professionals consider video to have the best ROI of any content marketing tool. Video is perfect for the short attention spans of today’s consumers, even scientists. Within 90 seconds or two minutes (you’d better have a good reason to go beyond two minutes), a well-crafted video can convey the key points of your selling proposition in a way that will stick in your prospect’s brain — it’s one reason PowerPoints in trade show booths may soon be a thing of the past. We recently completed a project consisting of 12 videos describing the proper use of our client’s laboratory collection kits for clinical trials. The same material had previously been contained in printed instruction manuals, but the addition of video, voiceover and textual support made the material dramatically more accessible, understandable, actionable and memorable. Whenever you have complex information to put across, video is often the best way to boil it down to its essence and focus on the key takeaways that make a difference in understanding how the product works or taking the next step in the buying process. Video is a strong and proven way to communicate any message. Done right, it allows you to control the presentation of your message exactly how you want the viewer to experience it. For viewers, it’s a medium that’s easy to understand, easy to remember and easy to share, and it reaches the recipient at an emotional level that’s hard to attain with text and static images. If video isn’t already central to your digital content strategy, maybe it’s time to rethink your strategy. Braeden creates motion graphics projects for SCORR’s clients. He specializes in live action video, animation and digital ads and has been influential in building digital libraries for an extensive number of national and global organizations. As a designer and motion expert, Braeden is always thinking outside the box. 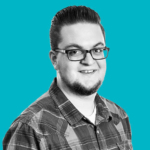 He works with the client services team to ensure that our clients’ motion graphics are innovative and on strategy.